Sealcoating is an inexpensive way to maintain your driveway, beautify your property, and increase your home’s value. 1-800-60-SEALit provides all your asphalt maintenance needs from large commercial parking lots to small residential driveways. We specialize in sealcoating, crack sealing, pothole repair, line striping, and paving. We go above and beyond to ensure that all jobs are handled flawlessly. Sealcoating pavement provides a protective layer that saves you money in the long run. We only use the best commercial grade materials available. When you use 1-800-60-SEALit, you can be sure to receive top quality work. We offer a sealcoating service that is unbeatable. We pride ourselves in using extensive preparation methods and the very best spray application for a unique, velvet finish. Our service just can’t be matched. We use only the best sealcoating materials. The cost of asphalt is relative to the cost of oil. As the price of oil goes up, so does the price of asphalt. Therefore, it is important to preserve your driveway as long as possible to prevent from having to repave it. Sealcoating provides a protective layer on your driveway and saves you money in the long run. Few things improve the curb appeal of a home like sealcoating the driveway. Sealcoating will give your driveway a rich, uniform color. It will add to the beauty of your home and protect the surface against heat, water, ice, cold, salt, and oils, ensuring a longer life for your driveway. You spend a great deal of energy, time, and expense making your home’s exterior beautiful and resilient. Your driveway deserves the same care and attention as your house and lawn. 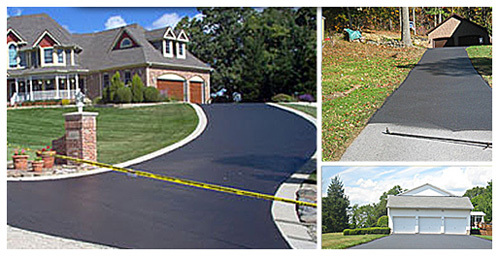 A dark, black-sealed driveway enhances your home’s appearance and beautifies your property. Call Now at 1800-607-3254 and Get your free estimate today! Your parking lot is a reflection of your business. 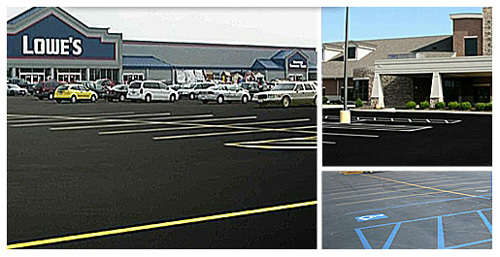 Sealcoating, crack repair, and line striping will make your parking lot stand out against the competition. Whether it’s an asphalt parking lot, driveway or path, that is not properly maintained, we can help. There is a wide range in sealant quality on the market today, and we only use the best sealcoating materials. Sealmaster premium industrial grade asphalt sealant will slow the damaging oxidation from the sun, pavement water penetration and improve appearance. 1800-60-SEALit can help you produce the results you are looking for. Call Now at 1800-607-3254 and Get your free estimate today! The first step to a perfect driveway is thorough cleaning. We clean your driveway with high powered blowers and steel brushes which will assure adherence of sealer to your driveway. Pressure washing may be necessary if your driveway is excessively dirty.